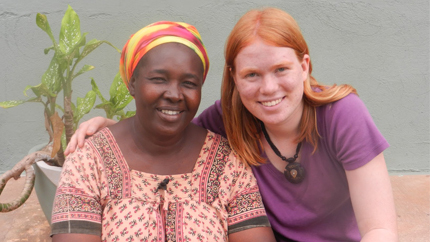 Sarah Bibbey (right) with a friend in Ghana. For Sarah Bibbey, a YES Abroad participant to Ghana in 2012-13, the end of her exchange represented new beginnings. Following the conclusion of her academic year sponsored by the Bureau of Educational and Cultural Affairs, Sarah cofounded an NGO in Kumasi, Ghana called Enliven Mama Africa, which empowers Ghanaian mothers through a diverse portfolio of strategies. Sarah's NGO aims to enrich rural communities in Ghana by creating employment opportunities for mothers, providing childcare, building school libraries, and facilitating volunteer opportunities to work on traditional farms. Although Sarah’s exchange might have ended, her passion has not. She currently attends Colorado State University and returns to her host community of Kumasi frequently. During these trips, she spends her time by rekindling the connections she made during her exchange year, which include the peers she met at school and her host family that she bonded so deeply with. She’s continued her blog from her exchange year and relishes opportunities to continue the YES Abroad experience. Sarah was awarded with a grand prize selection in the Bureau’s “Citizen Diplomacy Challenge” due to her continued and demonstrated commitment to her host country. Sarah received this recognition due to her tremendous work following her exchange, primarily through her involvement with Enliven Mama Africa, but also for giving school presentations and continuing her deep relationship with Ghana.